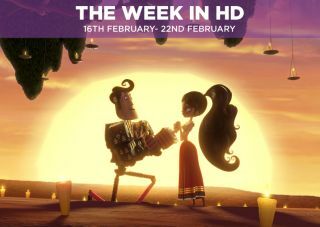 The Week in HD – Monday 16th February | What Hi-Fi? With the fifth series fast approaching (13th April), why not remind yourself of what happened in the Seven Kingdoms of Westeros and the vast cities of Essos? The Lannisters' downfall begins, Dany's reign widens as her dragons become more ferocius, the Wall is breached, Arya delves further into the darkness, and the Martells are the newest, coolest family in Westeros. Bloody, backstabbing, brutal and brilliant - we love this show. The pizza-loving, perpetually adolescent, mutant ninja turtles are given the Michael Bay treatment, complete with Megan Fox as the reporter April O'Neil. Compared with Transformers 4, TMNT is an enjoyable step up, but despite the infusion of charm, this is still a perfunctory reboot. Also comes with a Dolby Atmos soundtrack in certain releases. Guillermo Del Toro lends his talent to Jorge R. Gutiérrez's lavishly animated Mexican fairy tale. Young bullfighter Manolo (Diego Luna) embarks on an adventure that sees him travel through three visually stunning worlds in a quest for love. Voice cast includes Zoe Saldana, Channing Tatum, Ron Perlman and… Ice Cube. There are plenty of scares in Australian hit-horror The Babadook, which sees a mother and child encounter a demon that's not as gentlemanly as it looks. Louis van Gaal's team rock up to Deepdale with Preston hoping to do what Yeovil and Cambridge couldn't, and send his team out of the cup. Will they? And will van Gaal keep playing Fellaini up front? Them. This one's a philosophical episode, looking at how the bedraggled zombie-fighting team have changed from the people they were before the undead took over. Can they go on surviving in the aftermath of all that they've done? The Erik Affair. The comedy show is back for a second series. Vic and Bob set Erik up on a blind date, but they have a falling out themselves over the band's debut performance at Julie's Bistro. Can they get their act together in time to help Erik choose an outfit for the night? The Champions League resumes with this titanic clash between the nouveau riche arrivistes of Chelsea and PSG. Zlatan will be hoping to make his mark, but Chelsea come into this match on a strong run of form. The Sound and the Fury. A new villain rears his head in this episode and it's none other than Hartley Rathaway (a.k.a. Pied Piper, looking like he's pretending to be a Hogwarts student). A former protégé of Dr. Wells who can now control sound waves after the particle accelerator disaster, the Pied Piper is out for revenge on his former mentor. The Eternity Injection. Elementary is back after the mid-season break, and it looks like Sherlock and Joan have finally reconciled after a half-series of being angry with each other. Fans of The Wire will recognise Larry Gilliard Jr. (who played drug-dealer D'Angelo Barksdale) as the neurochemist involved with the life-prolonging drug. Bad Boys. Dean gets a call for help from Sonny - an old friend who runs a house for delinquent boys, where Dean once stayed when he was younger. For long-time fans of the show, it's a great insight into the life of young Dean, the terrible parenting skills of John Winchester, and how different Dean's life could have turned out if he hadn't been sucked into hunting demons for eternity. Anne Boleyn becomes pregnant again and is determined to give Henry a son, but beautiful Jane Seymour has caught the King's eye. As the Seymours enlist Cromwell's help and Catherine falls ill, Henry is wounded at a jousting match - giving everyone a stark reminder about how frail their position at court is without the King's favour. With the Oscars taking place at the end of this week (Sunday 22nd February, hosted by the fabulous Neil Patrick Harris), tonight's show is all about the films and actors in the race to win the golden statue, and those that missed out. Also on review tonight is cyber-thriller Blackhat, starring Chris "Thor" Hemsworth. Midnight City. Vinnie Jones guest stars as baddie Brick, and we can't decide if this makes Arrow a better or sillier show for it. Laurel, meanwhile, takes her first stab at being the new Canary. Spurs commence battle with La Viola as a place in the last 16 beckons for the winner. Corporate team building. Three words that could lead anyone to shudder in despair. Or commit murder. DI Goodman's investigation takes twists and turns as he's plunged into a cutthroat world when an entrepreneur is killed on the island. With everyone in the small, Nordic town of Fortitude hiding something, the number of suspects is hard to cut down. DCI Morton (Stanley Tucci) takes full control over the case after Dan Anderssen's outburst last week, while Elena's secretive past threatens to come to light. Michael Connelly's pulp detective Hieronymus 'Harry' Bosch comes to life in Amazon's latest original series. Titus Welliver (yes, that is the Man in Black/Smokey from Lost) plays Harry Bosch, a tough-talking detective who doesn't always toe the line. All ten episodes of the series are out a la Netflix, and you can read our review of the first four episodes. Through A Glass Darkly. Astronomer Marmion invites the royal household to his magnificent observatory to watch the solar eclipse, but his plans take a much darker turn, and The Musketeers have no choice but to accept the help of their oldest enemy - Milady. Stanley Kubrick's 1968 epic cult film charts the progress of man, space travel and the iconic HAL 9000 - a sentient computer that controls the spacecraft on a mission to Jupiter. We won't give too much away, but this is a sci-fi masterpiece like no other, and one that Christopher Nolan's Interstellar drew inspiration from. Jesse Eisenberg, Woody Harrelson and Emma Stone fight the zombie apocalypse in this slick, brilliant comedy-horror with an inspired guest performance by Bill Murray. Warning: will make you crave Twinkies. Clarkson and May conduct a nostalgic homage to Peugeot, while Hammond pits German engineering against American muscle in a head-to-head test between the Porsche Cayman GTS and the Chevrolet Corvette. Meanwhile, May heads to Italy to test the hybrid hypercar Ferrari LaFerrari. Everything is awesome in this fantastically animated film about ordinary, un-special construction worker Emmet, who finds out he's 'The Special' - a prophesised master-builder of the Lego universe who will save them from the terrifying prospect of being superglued forever. Every single thing is made out of Lego and existing Lego sets, while superstar mini-figures (Batman, Gandalf, Abraham Lincoln and many more from comic superheroes to Star Wars) are littered across the film. It's brilliantly funny, and has plenty of surprises in store to delight all Lego fans. We still can't believe the film didn't make the nominees list for Best Animated Film at this year's Oscars. After the unexpected death of Barry Fairbrother, the parish council election is underway. But the seemingly idyllic town of Pagford is in for a nasty surprise when posts from 'The_Ghost_of_Barry_Fairbrother' crop up on an online forum, humiliating the residents by revealing their secrets for all to see.